In 2013, there were over 66,000 more women between the ages of 25-49 living in New Zealand than there were men. This so-called ‘man drought’ is a hot topic for journalists and academics alike, who comment on how the situation might affect New Zealand women’s chances of finding love. Yet they rarely stop to ask women their own opinions on the matter. 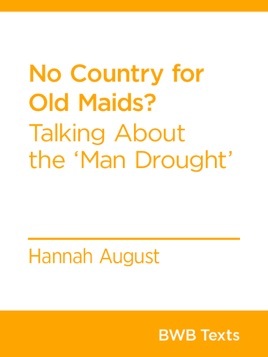 In this BWB Text, Hannah August does just that, integrating interview material, statistics and cultural commentary in order to demonstrate why we need to talk differently about the ‘man drought’.